Arduthie House Tea Rooms opened on March 24th, 2016 and has been described as an 'oasis of calm serenity'. 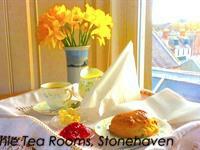 Specialising in Afternoon Teas and Cream Teas, we also offer delicious homemade cakes, bakes, and scones. And if you fancy a spot of lunch we will delight you with homemade soups, homemade quiches, and a whole lot more. 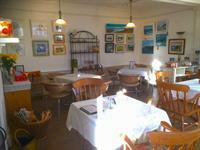 Much of our wall space in the Tea Rooms is full of original paintings, prints, and photographs from local artists which are for sale and on cold days we light the log fire for that warm cosy feel. Whatever else is happening around you, it's so important to make time for a cuppa. It goes a long way in helping you restore your karma and get things back onto an even keel. With the barely audible chatter of others around, the very edible cake on a plate in front of you, and the somehow reassuring smells of tea and coffee permeating the air, peace once again settles upon you and holds you to her bosom. Sorry that's probably overstating it, but hopefully you know what I mean. 21st century living can be hectic and fast and noisy and unsettling. So take some time out. Have some 'me' time. Get that perspective back. You can even catch up with the profound thoughts that emanate out of Arduthie House Tea Rooms from time to time as they dip their toes into the murky waters of Facebook.